You may think that the term “medical marijuana” refers to one kind of drug for one purpose. But, cannabis medication works as its own medicine cabinet. Different types of medical cannabis treatments are more effective for certain times of day, conditions and symptoms. One of the ways we distinguish the types of medical marijuana is by strain. If you go to the garden store, you won’t find seeds simply labeled “cucumber.” Instead, you’ll find different varieties of cucumber to grow. Cannabis works the same way — it comes in many types we call strains. Some marijuana strains work better for daytime use than others. Find out how you can adjust your medicinal cannabis treatment to feel energized and ready to take on the day. Why Do I Need a Daytime Strain? Newbies to marijuana medicine may wonder why some strains work better when you take them during the day. Marijuana strains have unique properties that make you feel specific effects, so it’s more important than you think to keep track of when you take certain cannabis products. Think about the effects we typically associate with cannabis. People who don’t know much about marijuana imagine it makes you feel relaxed, sleepy and giddy. But, not every strain makes you feel tired — in fact, some do the exact opposite. Energizing strains can help you avoid any sedative effects and even treat symptoms like fatigue. While you can take more relaxing strains before bed, doing that isn’t always optimal. If you need your medicine to help you function during the day, it helps to take it in the morning for the strongest effects. You can also use different strains at certain times of day to take advantage of their benefits when you need them most. When you shop for the right daytime medicine, you want to get a strain with certain attributes. It’s not only a matter of energizing vs. relaxing — a good daytime strain will let you function throughout the day. The top qualities of a good daytime strain include its energizing, mind-clearing, mood-lifting and focus-enhancing effect. Most importantly, what you should look for in a daytime strain depends on your lifestyle, symptoms and priorities. If you don’t have any mood or focus issues, you might only need a medication that doesn’t get in the way of daily living. Patients who don’t go to work or school might not mind a little impairment since they don’t have to focus on anything specific during the day. Think about how you want to feel at each time of day when you choose your medicine. As you can see, sativa strains tend to provide the most energy — but, don’t ignore hybrid strains. While just about any strain you can find on the market is technically a hybrid, crossbreeding presents more options for patients. Some hybrids have nearly equal proportions of indica and sativa qualities, letting you get the best of both worlds. Even though sativa strains give you a zip, some can make you feel so giddy that it gets in the way of mental functioning. The components in indica strains balance out that effect, letting you medicate during the daytime. Cannatonic: This strain’s even balance of indica and sativa qualities enhances the user’s focus, calms their mind and lifts their mood. Since it has less THC than many sativa strains, it has a lower chance of causing psychoactive effects. Jack Herer: With 55% sativa and 45% indica, Jack Herer offers a balanced medicating experience. If you have symptoms like pain and nausea that react better to indica strains, you can get relief from this strain without feeling drowsy. Amnesia Haze: As a sativa-dominant hybrid, Amnesia Haze boosts energy without creating as much of an edge. 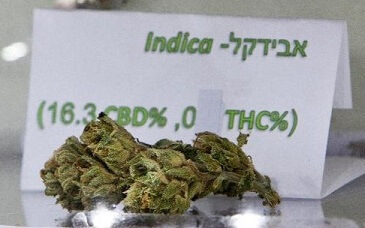 Its 80:20 sativa to indica proportion helps patients who want to benefit from just some of indica’s properties. Amnesia Haze especially excels at clearing your mind and enhancing your mood. Blue Dream: Patients who want both energy and anxiety relief might enjoy Blue Dream. It still has mostly sativa qualities, but just barely — it has a 60:40 ratio. So, you can feel happier without any extra nervousness or anxiety. Sour Diesel: If you have a high tolerance to sativa strains’ cerebral effects, you might prefer the intensity of Sour Diesel. It can give you the kick you need to boost your creativity and productivity. How much can this strain help me focus? Will this strain energize me? What symptoms does this strain treat the most effectively? Before you go to the dispensary, write down the top traits you want your strain of choice to have. You should also think of a few questions we haven’t listed to help you find a product that suits your preferences. Creating an effective treatment plan takes a team of experts. Marijuana-friendly doctors can evaluate you and write recommendations, while a dispensary staff can answer your questions and teach you about their products. Use our online database to find professionals near you today.